Metabotropic glutamate (mGlu) receptors are G-protein coupled receptors (GPCRs) that have been subdivided into three groups, based on sequence similarity, pharmacology and intracellular signalling mechanisms. Group I mGlu receptors (mGlu1 and mGlu5) are coupled to PLC and intracellular calcium signalling, while group II (mGlu2 and mGlu3) and group III receptors (mGlu4, mGlu6, mGlu7 and mGlu8) are negatively coupled to adenylyl cyclase. Together with the GABAB receptor, Ca2+ sensing receptors, pheremone receptors and taste receptors, the mGlu receptors form a family of receptors that are distinct from the adrenergic-type GPCRs. Both receptor superfamilies possess a 7-transmembrane domain motif (TMD), with a similar packed structure. 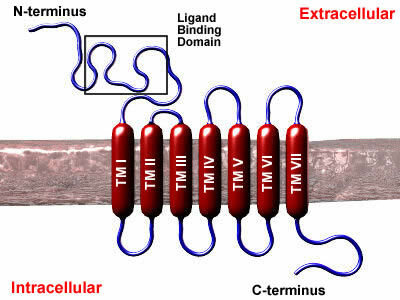 However, in contrast to the adrenergic-type GPCRs, the mGlu receptors possess a much larger N-terminal domain and no large inter-helical loops. As with so many neuroreceptors, alternative splice variants are also found for each mGlu receptor. It has become clear that, while many GPCRs can be activated as individual, monomeric receptors, most also exist as dimers. This is particularly true of Class C GPCRs like the mGlu and GABAB receptors. Indeed, dimerization involves the formation of di-sulphide linkages between the N-terminal domains of the two individual receptors (Ramano et al, 1996) and under non-reducing conditions, nearly all mGlu Receptor populations exist in this form. Thus the individual receptor proteins can be viewed as subunits while the dimer is viewed as the receptor proper. The large N-terminal domain of the mGlu receptor contains the ligand binding site, which is formed by two hinged globular domains - the so-called Venus Flytrap Domain (VFD). Binding of glutamate causes the two domains to close, providing the structural change in the TMD that triggers intracellular G-protein activation. 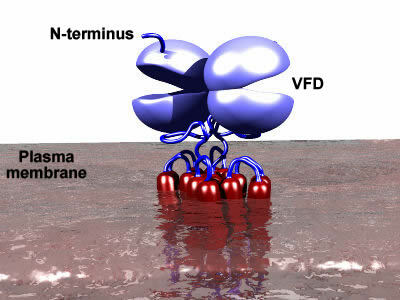 Interestingly, it has been reported that the binding of agonist to one VFD is able to activate not only the G-proteins associated with it's own TMD, but also those associated with it's partner subunit, (cis- and trans-activation, respectively; Brock et al 2007), though only a single subunit may be activated at a time. In this context, it is interesting that strong negative cooperativity between the individual binding sites exists (Suzuki et al 2004), thus presumably ensuring that only one binding site is occupied. mGlu receptors are generally widely distributed throughout the mammalian brain and was recently reviewed in Ferragutti & Shigemoto 2006. The two group 1 receptors, mGlu1 and mGlu5 have wide but complementary distributions in the brain. The mGlu1 receptor is found at very high levels in the cerebellum and thalamus. In the hippocampus, it is found principally on interneurons, the cell layers of the CA1 and the dedritic fields of the CA3 and dendate gyrus. The mGlu5 receptor is found in superficial cortical layers and the olfactory bulb, among other regions, while in the hippocampus it is found in the dendritic fields of CA1 neurons rather than the cell body layers, though the distribution overlaps with the mGlu1 receptor in the dendate gyrus and CA3 regions. The reason for this largely complementary distribution is unclear, but may relate to the different intracellular signals that are delivered by these two receptors, even though they both use the same signalling cascade. the mGlu5 receptor is well known to support Ca 2+ oscillations following activation, via rapid phosphorylation/dephosphorylation cycles while the mGlu1 receptor activation results in a single spike in Ca 2+ concentration ( Kawabata et al 1996). Activation of mGlu5 receptros has also been shown to elevate nuclear Ca 2+ concentrations ( O'Malley et al 2003), strongly suggesting a role in the modulation of gene expression. The location of mGlu1a in the post-synaptic membrane is also highly specific. It is found surrounding, but not within the post-synaptic density. This very precise localisation is likely to be brought about by regulatory proteins which bind to the intracellular portions of the receptors. A likely candidate for these proteins are the Homer family of small, PDZ domain-containing proteins, that interact with group I mGlu receptors. The group 2 mGlu receptors, mGlu2 and mGlu3, are very difficult to separate from each other with immunological or pharmacological techniques, as the proteins share so much sequence similarity. These receptors are widely distributed through the cerebral cortex, and in particular in the cerebellum. However, the distribution is segregated from that of the group 1receptors. Thus the mGlu2 receptor is found in the deeper layers of the cortex, rather than in the superficial layers like the mGlu5 receptor. Similarly in the cerebellum, mGlu3 receptors are found in the Golgi cells rather than the Purkinje cells, where the mGlu1 receptor is expressed. In the hippocampus, the mGlu2 receptor is found mainly in the pre-synaptic boutons of the mossy fibres and the perforant path. This reflects a common aspect of the group 2 receptor cellular localisation, namely that they are often found on pre-synaptic elements rather than post-synaptically. They thus regulate the release of neurotransmitters and so can modulate not just glutamatergic transmission, but that driven by other transmitter molecules, such as dopamine and cannabinoids. The distributuion of the group 3 mGlu receptors is generally more restricted than that of the other members of this family. The mGlu4 receptor is expressed principally in the granule cells of the cerebellum though it has also been found in the CA1-CA3 regions of the hippocampus, olfactory bulb, striatum and entorhinal cortex. mGlu7 receptors have a much wider distribution, being found at high levels in the olfacytory bulb, spinal cord and thalamus, among others. In the hippocampus, high expression can be found in the CA1 region as well as the dendate gyrus. The mGlu8 receptor has an even more restricted distribution, with scattered expression in the cortex and more robust expresion in the cerebellum and olfactory bulb. In the hippocampus, it's expression is restricted to the terminal fields of the lateral perforant path. Like the group 2 receptors, the group 3 mGlu receptors are found pre-synaptically, and so modulate neurotransmitter release.